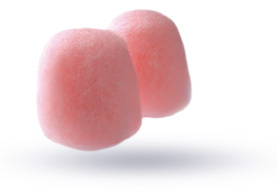 • Superior wax earplugs designed to protect your ears from noise, wind and moisture. • Effectively blocks noise. Ohropax Classic insulates noise across the entire frequency range. • Discreet, skin coloured wax that is soft and malleable to perfectly fit your ears. • Ideal for sleep and work. Comfortable to wear and skin-friendly. • Fits every ear without applying pressure. Ohropax Classic are the leading wax earplugs, expertly manufactured to protect your ears from noise, wind and moisture. Ideal for sleeping, reading, work, loud music, DIY activities and simply relaxing. Made in Germany, the Classic Wax earplugs are Ohropax's flagship product and have helped to reduce noise for millions of users since 1907. Ohropax Classic earplugs greatly reduce noise across the entire frequency range. Particularly suitable for use at home, large office and work environments and for use during work requiring concentration. The wax moulds to your ear canal perfectly and creates a tight seal, successfully blocking wind and moisture. Classic Wax earplugs can be easily moulded to fit all ears. They are single use earplugs. 1. Before inserting the earplugs, use clean fingers to fully remove the cotton wool. If you need to make the plug smaller, do so by tearing off some of the wax material. Do not reuse any material that you have removed from the earplugs. 2. Knead the earplug until it is soft and then form a smooth and sufficiently sized ball that you can lightly push into the opening of your ear canal to form a tight seal. Do not push the earplug deep into your ear canal. 3. Once you have finished with the earplug, carefully remove it using only your fingers. You can loosen the earplug by lightly pressing on the auricle from behind. Do not use any hard or pointed objects when removing your earplugs. When not in use, store the earplugs in their original packaging below 30 degrees. Product information "Ohropax Classic Wax Earplugs"
Packaging Classic Wax earplugs come in a handy storage container with 12 earplugs (6 pairs) inside. Materials Made from a variety of paraffin waxes, petroleum jelly and individually wrapped in cotton wool. 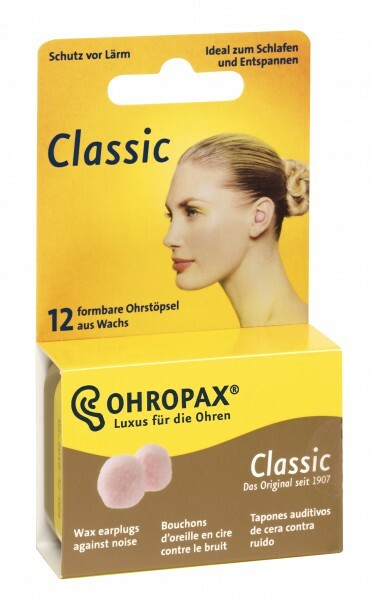 Related links to "Ohropax Classic Wax Earplugs"
Customer evaluation for "Ohropax Classic Wax Earplugs"